Thus far, all the recipes I have posted are tried and true family favorites. In fact, that’s what I intend to post most often! However, today I thought it would be fun to try a new recipe and post how our family liked it – a “test kitchen,” if you will. So here goes! Combine dry ingredients. Whisk wet ingredients, pour into dry mixture, and stir until just combined. Over medium-high heat, scoop 1/4 cup batter onto skillet per pancake. Flip when bubbles appear. Cook until golden brown. I am a big fan of Chobani yogurts and I was eager to try this recipe out. The kids enjoyed them and ate all that was on their plate, even my non-pancake eater. I thought the texture of these was very interesting. Much like the greek yogurt inside them, these pancakes have a creamy texture that is a little different from ordinary pancakes. My only advice would be to make sure they are well done on the skillet to ensure that the resulting texture doesn’t end up being gummy. I think these were quite tasty with just a light dab of butter and fresh fruit on top. I would not add a lot of syrup to these, again because of the risk of them becoming gummy. 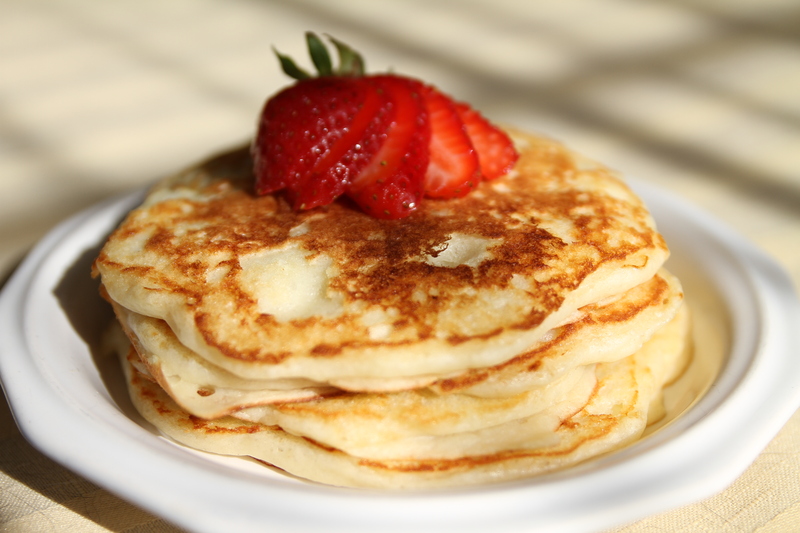 Next time I make these, I think I will make mini pancakes and stack them with sliced berries and pineapple. All in all, I’d say this recipe is worth a try – I’ll be making them again!